Mena House Club is situated on top of Chalemar Hills-Baabdat surrounded by breath-taking views of pine tree covered mountains. 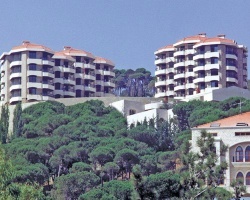 The resort is only 30 minutes (8 kms) away from Beirut where you can enjoy winter skiing in the mountains 1500 metres above sea level and in the summer months you can enjoy the beach area which is 34 kms away. Facilities which surround the seven circular buildings where each floor consists of one apartment, include outdoor swimming pool, sauna and bar. There are two restaurants near to the resort and horse riding is available 5kms away. Price drastically reduced from $35,000 to $29,000! Owner has 56 RCI points to transfer to a buyer with membership! 2017 fees paid!